John McCain claimed that it is so safe that “even Paris Hilton could ride a bicycle in a bikini through Anbar province.” Paris Hilton could be riding a bicycle dressed in this bikini through the Anbar province and still be safe if she had as much protection as John McCain did on his recent trip to Iraq. At least that’s the conclusion reached by Tom Aspell of NBC News as reported by Think Progress. 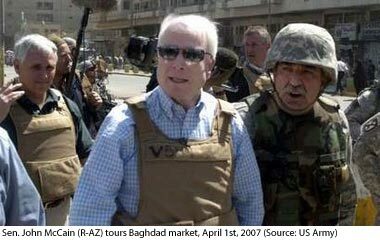 McCain, who previously claimed that the war is a success and Iraq is safe, was accompanied by “100 American soldiers, with three Blackhawk helicopters, and two Apache gunships overhead.” McCain also chose to wear what appears to be a bullet proof vest instead of a bikini. Posted in Iraq, John McCain. Tags: Iraq, John McCain, Paris Hilton. RSS feed for comments on this post.. TrackBack URL. Paris Hilton wearing a bikini is more dangerous than a time bomb as people try to grab her and get arrested. I just found some great information at http://www.howtotalkback.com the site helps you answer questions those idiot conservatives throw your way.